This section describes and lists all TRAXX AC3 locomotives that have been ordered by Deutsche Bahn for its long-haul intercity services (DB Fernverkehr). Next one is out: DB Cargo 187 083. Read about these new locomotives here. Bombardier Transportation announced today that it has received a call-off from Deutsche Bahn AG (DB) to provide 25 double-deck intercity trainsets for DB Fernverkehr. 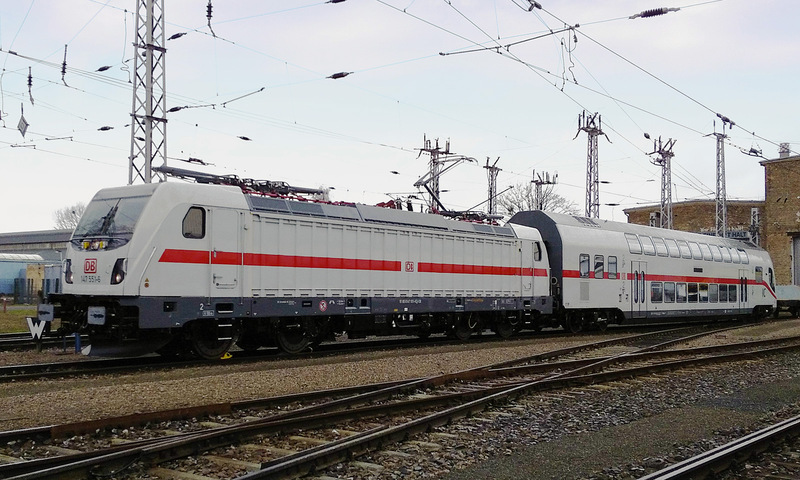 The 5-car trainsets consist of 25 TRAXX locomotives and 124 (Railcolor: 125 are needed, but one comes from a previous order) Twindexx Vario double-deck intercity cars. This order is based upon two framework agreements signed with DB in 2008 (Twindexx) and 2013 (TRAXX). Delivery of the 25 trainsets is scheduled to start in 2019. "The signing of the contract for 25 new Intercity 2 trains is an important milestone in our long-distance transport campaign, which will expand our service by 25 percent by 2030. With the new vehicles, we offer our customers a particularly comfortable and reliable travel in long-distance traffic," says Birgit Bohle, Chair of the Management Board of DB Long Distance. "This order is a great achievement for our rail business and it also signifies the continuation of our successful long-term cooperation with Deutsche Bahn", said Michael Fohrer, Managing Director of Bombardier Transportation Germany. "We are pleased that DB relies on our modern and proven double-deck trainsets to further expand its mobility services in different regions. Thanks to the single-car platform concept, these new Twindexx Vario cars are fully compatible with previous models, which provides maximum flexibility in operation." Passengers will benefit from greater comfort through ergonomic seats and adjustable headrests, larger luggage spaces and stronger signals for mobile phones. Equipped with the European Train Control System, ETCS BL3 - Level 2, the trainsets will be homologated for cross border traffic in Germany and Switzerland. An extended maintenance data transmission system will support in optimizing service inspections. Each five-car trainset will be pulled by a third-generation TRAXX AC3 locomotive fitted with sophisticated concepts to maximize energy savings in operation. Yes, you most likely know the story of the 27 DoIC trains for DB Fernverkehr already. Their approval for Germany is delayed but is nearing completion. These trains consist of a Traxx P160 AC2 locomotive coupled with 5 double deck Twindexx coaches, all built by Bombardier. But there is more to come. The DB has placed a second order for double deck trains for Intercity services. Similar to DoIC, these DoIC2 trains will be loco hauled and have five coaches each. A 2nd class driving trailer, three intermediate cars 2nd class and one intermediate car 1st class. This makes 85 coaches in total. Bombardier will supply three extra coaches, two driving trailers and a 1st class car. DB Fernverkehr will operate these trains on the Gäubahn (Stuttgart - Zürich), as of December 2017. The trains will also be accessible to passengers of DB Regio. The total frequency of IC services on the line will increase considerably. Additionally, the new trains will also be used on the IC connection Karlsruhe – Pforzheim – Stuttgart – Aalen – Nürnberg. Having to go to Zürich means that the DoIC2 will have to be homologated in Switzerland. The coaches need to be lowered by 40 mm to meet the Swiss loading gauge (CH-Lichtraumprofil EBV-02). The locomotives will need all required safety and detection systems for the Alp country. This brings us to the most interesting part of this news, considering our website. These seventeen trains will be pulled by Traxx AC3 locomotives. Yes the new Traxx model, for DB passenger services designated as 147 series, will come in the light grey livery of DB Fernverkehr too (as the 147 is already ordered for DB Regio too, but they will be red). In short: soon there will be the Traxx P160 AC3 with DE/CH approval. Detailed information can be found on mvi-baden-wuerttemberg.de. We will start to prepare a section for this new type of locomotives.